LittleBigPlanet's physics ensure that there's an element of unpredictably to any scenario that involves balance, momentum, and moving objects. In other words, every LittleBigPlanet scenario. I built levels - and played levels built by others - that didn't always work as intended. The unexpected results, which may have involved incinerated, smashed, or catapulted Sackboys, were often hilarious. Sometimes, though, they were frustrating. I once made it most of the way through a challenging level, died, and then respawned in an area that had been so altered by collapsing and exploding structures that I couldn't find my way back to where I'd perished. In other games, these design flaws are bugs. In LittleBigPlanet, they're something more. They're opportunities. Because every time you send your Sackboy through a LittleBigPlanet level - any level - you see what's possible. And what's not. You see what works, and what doesn't. What you should do, and what you shouldn't. Playing LittleBigPlanet's levels isn't just fun, it's educational and inspirational. When I encountered another user's mechanical dragon, I thought, "Hey, I can make that." And then I jumped into the level creator and tried to build a better dragon. That's a big part of LittleBigPlanet's genius: If you see it, you can build it. There's no arcane, behind-the-scenes programming magic to contend with, either, just the game's believable building blocks. This player-creator feedback loop, in which playing informs building and vice versa, virtually guarantees the emergence of a stellar subset of community content. Nearly all of the beta user levels I downloaded were entertaining, but some were astounding. My assumptions about what users could accomplish with the level creator (and by extension, what I could accomplish myself) were blown away with surprising regularity. With regard to my original concern, LittleBigPlanet's dimensionally compressed, sidescrolling presentation is, if anything, a huge asset. Managing the unforeseen and sometimes complex effects of its physics-based gameplay would be vastly more difficult in three-dimensional space. Perhaps more importantly, everyone's familiar with side-scrolling games. It's an easily conceptualized and unintimidating format that still provides room for boundless experimentation. Media Molecule's biggest challenge may be in managing and organizing the massive amounts of content users will upload and share. LittleBigPlanet's charming content selection system provides level descriptions, statistics, and keyword-based ratings and searches, but it doesn't include robust options to narrow or sort search results. Browsing user content seemed like a slightly random affair. LittleBigPlanet will also depend upon a YouTube-like community input system to flag mature or inappropriate content. 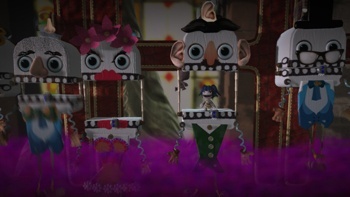 LittleBigPlanet looks to be as brilliant as it is beautiful. I can't wait to see how the user-shared content possibilities play out after its release next week. Which, as far as I'm concerned, can't come soon enough. Adam LaMosca is a writer and researcher in Portland, Oregon. He's currently trying to convince his wife to knit a fill-size Sackboy suit he can wear to the office.